According to the World Health Organization (WHO) in 2017 approximately 300 million people were suffering from depression across the globe. Anxiety disorders are characterized by uncontrollable worry about daily events in a person’s life. Significant rise in the number of people suffering from generalized anxiety disorder has led to the growth of therapeutics market. The market would generate over $7.4 billion in revenues by 2023 at a CAGR of over 2.5% over the forecast period 2018-2023. The increase in the development and production of various drugs in this area is considered as one of the reasons for the market growth. On other hand, anxiety therapies and devices segment is growing with a remarkable Cumulative Annual Growth Rate owing to its high efficiency in treating anxiety related disorders and increasing demand. Anxiety disorders are characterized by uncontrollable worry about daily events in a person’s life. The different kinds of anxiety include generalized anxiety disorder, panic disorder, specific phobias, agoraphobia, social anxiety disorder and separation anxiety disorder. Generalized anxiety disorder (GAD) includes certain symptoms such as headache, tension, profuse sweating and tiredness. It has been observed that GAD occurs along with other anxiety disorder and depression. A large number of factors are responsible for the occurrence of GAD such as genetics, brain chemistry, and exposure to stressful event, family background, or life experiences. 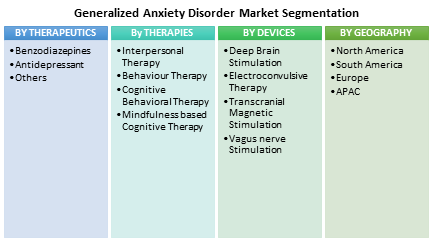 This report incorporates an in-depth assessment of generalized anxiety disorder market by therapeutics type, therapies, devices and geography. Fisher Wallace Simulator, an FDA-approved neurostimulation device to help treat depression, anxiety and insomnia. It is headband like device which stimulates the brain to release certain hormones such as dopamine which is known to reduce stress. Fisher Wallace Stimulator makes it possible to sit at home and engage in neurostimulation therapy. This can help patients to be naturally treated with the same effect as that of an antidepressant. Scientists are currently working on finding the biomarkers that will categorize anxiety disorders more accurately. This data would help to understand the response of each drug to a particular disorder and thus could help to push therapeutic research forward driving the market during the forecast period. Aloradine, a nasal spray-delivered agent, has a novel mechanism of action that stimulates nasal chemoreceptors. This transmits messages rapidly to the brain’s limbic system, amygdala and hypothalamus directly modulating brain autonomic, psychophysiological, and neuroendocrine responses and reducing stress and anxiety. This drug can be self-administered using a simple, low-cost device. Currently, there is a lot of research going on to qualify a probiotic as a psychobiotic which would specifically provide mental health benefits. The effect of psychobiotic in the intestine would be conveyed to the brain and the other organs by the vagus nerve which is known to have a link between the nervous system and the digestive system. Who are the Major Players in Generalized Anxiety Disorder market? The report incorporates in-depth assessment the competitive landscape, product market sizing, product benchmarking, market trends, product developments, financial analysis, strategic analysis so on to gauge the impact forces potential opportunities the market. Apart from this the report also includes a study major developments in the market such as product launches, agreements, acquisitions, collaborations, mergers so on to comprehend the prevailing market dynamics at present its impact during the forecast period 2018-2024. All our reports are customizable to your company needs to a certain extent, we do provide 20 free consulting hours along with purchase each report and this will allow you to request any additional data to customize the report to your needs. Evaluate market potential through analyzing growth rates (CAGR %), Volume (Units) Value ($M) data given at country level – for product types, end use applications by different industry verticals. Underset the different dynamics influencing the market – key driving factors, challenges hidden opportunities. Get in-depth insights on your competitor performance – market shares, strategies, financial benchmarking, product benchmarking, SWOT more. Analyze the sales distribution channels across key geographies to improve top-line revenues. Underset the industry supply chain with a deep-dive on the value augmentation at each step, in order to optimize value bring efficiencies in your processes. Get a quick outlook on the market entropy – M&A’s, deals, partnerships, and product launches all key players for the past 4 years. Evaluate the supply-dem gaps, import-export statistics regulatory lscape for more than top 20 countries globally for the market.